Our pumps for the field of waste/sewage water handling are usable in various fields of application. These range varys from emptying of tanks (stationary, mobile or on ships) with sewage or waste water through recycling in process field to the simple pumping out of pits and sumps. All of our waste water and drainage pumps are adapted depending on the series to the specific needs from mild to highly polluted liquids up to sewage water. Classic sewage pumps are known for a wide free pass. Our Series AWP is optimized to have a free passage in size of the pressure flange. For the fact of this, blockage is nearly impossible. We offer our sewage pumps in different versions with free passages from 25mm to 150mm. 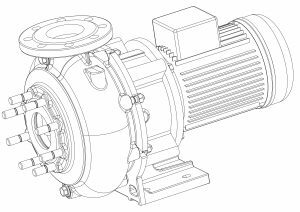 We offer all pumps with different impeller types like 2 or 3 blade channel type or vortex impellers. Some of our sewage pumps can be equipped with a macerator in front or a integrated fiber cutting device. All our pumps could be delivered in different material executions matching the medium and environmental issues. All versions could be delivered in a submersible or a dry mounting execution. Our customers can choose from different kinds of pumps with motors for dry set up or submersible motor. These drainage pumps are also known as vertical set up submerged pumps. You can use this pumps in small pits and sumps to drainage them. The Advantages are the dry mounted motor, the non-sensitivity of the pump for sand and small stones and the ability to use this pump with high temperature mediums. We deliver different performances, which have a flange between 1 1/2“ und 2 1/2“. Belonging on the customer’s preference we can vary the mounting length between 0,65m and 2,65m, longer mounting lengths are available for some types on request. Additionally we offer float switches to realize automated start and stop functions. All our pumps could be delivered in different material executions matching the medium.